Here’s another from Fin Records out in Seattle and this time it’s the energetic five piece band STAG who also hail from Seattle. Unlike the last couple of singles we’ve covered from Fin, this one hits much harder. We say that off the bat because it’s a much welcomed change of pace (for us, at least) from Fin Records. However much like their other singles, this one still features lush, crystal clear production values and easily understood vocals – something we’re definitely not always partial to around here. 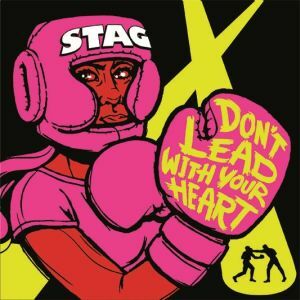 We’re not complaining, instead just trying to say that this time Stag seem to be doing something right with their humongous guitar sound. The self-titled opener is a sure power-pop anthem at a medium pace, with awesome guitar leads dominating throughout the track. About three-quarters through you’ll find yourself in the midst of a weeping guitar serenade on top of the fit and established rhythm, which eventually leads you out of the this warming track. Focusing on the B-side reveals an even larger sound, rounded out early on with triumphant trumpets and a mystically plucked guitar lead. This again proves just how experienced these guys sound with their ultimately classy rock and roll sound, because soon enough this spins headfirst into an electrified minefield of high voltage guitar that will no doubt catch you off guard with it’s spiky twangs and sharp angles. Once you reorient yourself after that guitar beat down, it’s no surprise if you look to start this track over from the beginning. Don’t forget to snag this one from Fin Records, and check out other postings regarding Fin right here – The Diving Bell – Seacats. BUY the 7″ directly from Fin Records – limited to 500 on pink vinyl ! Posted on September 7, 2011 September 10, 2011 by styrofoamdronePosted in 7", ReviewsTagged indie rock, pop, power-pop. I appreciate a music blog that loves 7″ vinyl, that appreciates well written, well crafted, well played music, and that is capable of writing a good sentence. Thank you, Styrofoam Drone.